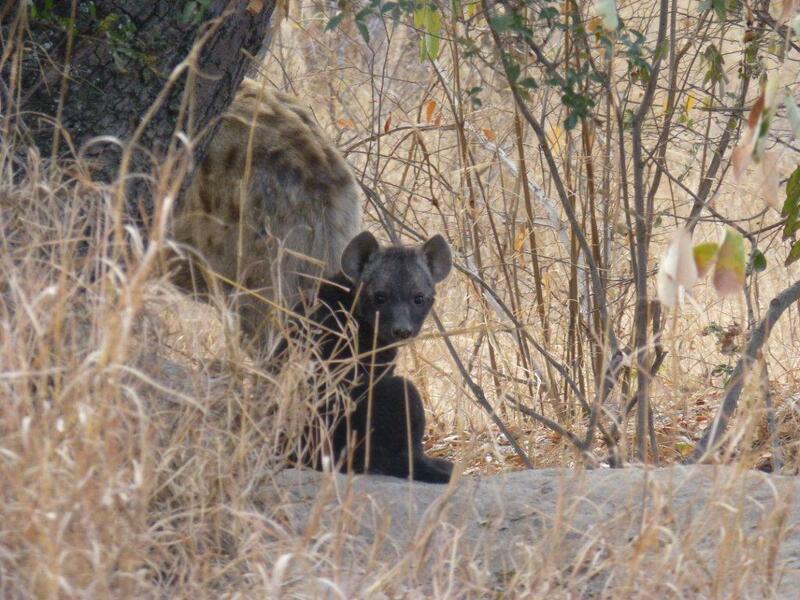 “It’s day eight and we had a week of amazing sightings that gave our group already the status as the ‘Lucky Group’. Just listen to this – day two we Zero, the big male lion, with two females; day three the hyenas with the babies; day five a jawless but massive rock python. Day six and seven passed without anything spectacular, so thankfully all was back to ‘normal' for our lucky group on day eight. “We woke up that morning discovering we had no water. A call from GVI, the neighbours, revealed that the elephants had come south and had been digging up water pipes. It is quite unusual for the elephants to be south in the reserve, especially in winter as it is much drier than the north. Besides, if they come, they usually arrive late evening and disappear overnight to the north. We were therefore happy to see they were here. “After a quick fix of the pipes to secure the water we went out with the game drive vehicle to look for the ellies. We heard them from the high reeds in the river. It’s an almost prehistoric sight of only their trunks snaking up out of the reeds to snap of overhanging branches. ”Then, as quick as a flash, a leopard leapt into the reeds! I thought I was dreaming, too eager to see a leopard again, but seeing the response of the students I was clearly not… It was amazing! Shortly after we heard an elephant trumpeting from the same direction, apparently harassed by the leopard and trying to chase it away. That worked as the leopard jumped again, now out of the reeds into our direction but swiftly disappeared into the grass again. “Our hearts beating fast, we stayed focussed on the edge near the river. 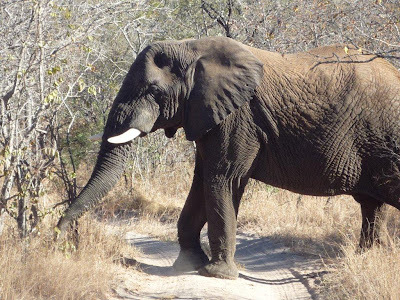 We didn’t see the leopard again, but slowly but surely the elephants come into sight. First a trunk, then some backs and a face. Nice! It seemed like the ellies would be there for a while so we decided it’s safe to go for breakfast. 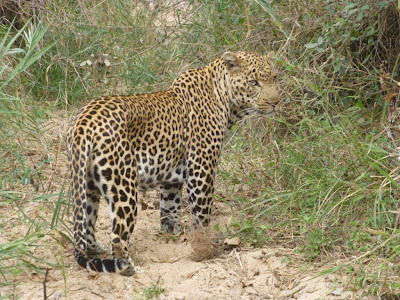 “Just as we crossed Spectra crossing, Scar, a male leopard, appeared, barely three metres from the vehicle, looking at us, a little bit disturbed but overall relaxed. We couldn’t believe our eyes! Like a real gentleman he posed a bit for the cameras and then lied down a bit further off. “It sounded like we were photographing some movie star with shutters going off left, right and centre, click-click-click-click! A little later Scar moved off between the reeds and we proceeded on our way back to camp, full of excitement! “The afternoon activity was obviously to follow up on the leopard and the herd of elephants. We first tried the leopard, but got nothing, no sights, sounds or even tracks. We decided to go for a nice sun downer at a nearby waterhole. Just as we arrived there, we discovered an elephant bull between the trees. We watched it for a while; it slowly came into the open, crossed the road in front of us and continued ripping off the bark while standing bum faced to us. An amazing sighting!